The Çameli Basin in southwestern Anatolia preserves a sequence of fossiliferous sediments that record the Pliocene and early Pleistocene faunal development in the area. Here, we present the fauna of Ericek, a locality near the bottom of the sequence. The locality is rich in fish remains, particularly pharyngeal teeth of the cyprinids Barbus, Carassius and Capoeta, but also includes rare tooth-bearing bones of a possible cobitid and gobiid. The abundant fish remains agree with the geological interpretation that the Ericek sediments were deposited in a palaeolake. That interpretation is further supported by the abundance of mollusc fossils. The gastropod fauna is dominated by Pseudamnicola, Valvata and other freshwater prosobranch taxa. The dominance of prosobranch taxa over freshwater pulmonate species indicates a well-oxygenated lake environment. A range of aquatic, swamp and terrestrial tetrapod taxa are also represented. The amphibian fauna, documented mainly by anuran skull and postcranial bones and by a single salamander jaw, is consistent with a lacustrine setting for Ericek. Notable among the amphibian fossils are two jaws that may document the second record of palaeobatrachid frogs from Anatolia. Reptiles are represented by a few, incomplete vertebrae of colubroid and indeterminate snakes. Micromammal molars suggest the presence of a forested environment surrounding the palaeolake. Muridae are represented by three species, of which Apodemus cf. dominans is the most abundant. The shrew Asoriculus is the second most abundant species, which argues for a humid palaeoenvironment. The co-occurrences of the vole Mimomys occitanus and of the murids Orientalomys cf. similis and Rhagapodemus cf. primaevus indicate a late MN 15 age for the fauna, at an estimated age of 3.4 Ma. 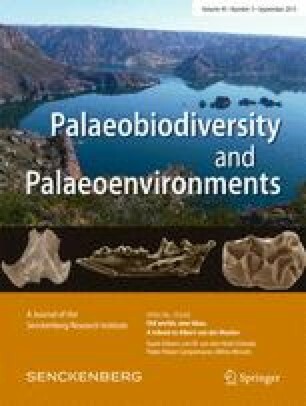 We dedicate this paper to Albert J. van den Meulen, in recognition of his contribution to our knowledge of the Plio-Pleistocene faunas of the eastern Mediterranean. Albert’s thesis stands as the starting point for the modern studies on arvicolid palaeontology, and as such he was a major inspiration and help in the career of Alexey Tesakov. Lysanne van Bennekom is grateful for the help provided by Wilma Wessels in studying the fossil murid collections at Utrecht University and for the discussions and help in identification by Hans de Bruijn. James Gardner thanks Jean-Claude Rage (Paris) for assistance with identifying the snake specimens and August Ilg (Düsseldorf) for running a search in the fosFARbase database for records of Pliocene amphibian and reptiles in Turkey. M. Cihat Alçiçek benefited from both a Temminck fellowship and a SYNTHESYS grant for consecutive visits to Naturalis. Alexey Tesakov and Hülya Alçiçek received Temminck and Martin fellowships, respectively, for their visits to the same institute. M. Cihat Alçiçek, Alexey Tesakov and Hülya Alçiçek benefited from the bilateral project of TUBITAK-RFBR (111Y192) and MCA granted by TUBA-GEBIP (Outstanding Young Scientist Award by the Turkish Academy of Sciences). We are grateful for the comments of Leon Claessens and an anonymous reviewer, which helped to improve our paper. Delia van Oijen (Naturalis) assisted with the electron microscope photographs and in making the figures. This is a contribution to NECLIME. Böhme, M., & Ilg, A. (2003). fosFARbase. Electronic database. Accessible at: http://www.wahre-staerke.com/. Accessed 28 Feb 2014. Froese, R., & Pauly, D. (eds.) (2013). FishBase. World Wide Web electronic publication. Version (10/2013). Available at: www.fishbase.org. Frost, D. R. (2014). Amphibian species of the world: An online reference. Version 6.0. Electronic database. Accessible at http://research.amnh.org/herpetology/amphibia/index.html. Accessed 26 Feb 2014. Hoek Ostende, L. W. van den, Diepenveen, F., Tesakov, A. S., Saraç, G., Mayhew, D., & Alçiçek, M. C. (2015). On the brink: micromammals from the latest Villanyian from Bıçakçı (Anatolia). Geological Journal. doi: 10.1002/gj.2622. The Reptile Database (2013). Electronic database, Accessible at: http://reptile-database.org/ Accessed 26 Feb 2014.